A Franco-Flemish double-manual harpsichord, originally a 'transposing' harpsichord made in Antwerp in 1617, possibly by Frans van Huffel. It was given a bass ravalement in Paris in 1750 by François Étienne Blanchet and it was later given a treble ravalement in 1786 by Jacques Barberini and Nicolas Hoffmann. The author of this painting has yet to be determined. But, like the painting of the figures on the top of the lid, it is of extremely high quality and compares with the best Parisian landscape artists active around 1750. 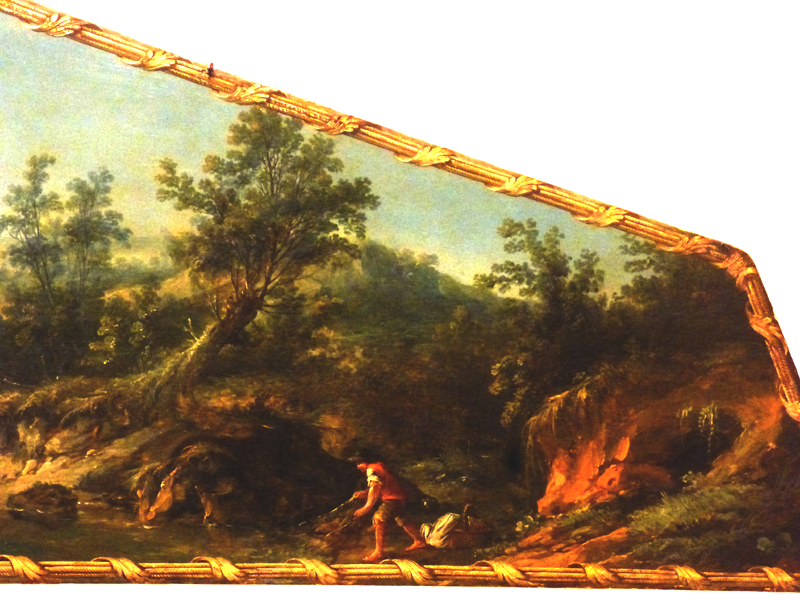 It shows a sylvan landscape with groups of figures engaged in rural activities. The figures are painted in a vigorous, free style and it seems likely that they hold the key to an eventual attribution of this landscape painting. For more details of the lid paintings at an early stage of cleaning and restoration click here. This page was last revised on 12 June 2018.